Just noticed this now. I'll see if I can re-upload them somewhere. Thanks for the heads up. Here's an updated measurement. 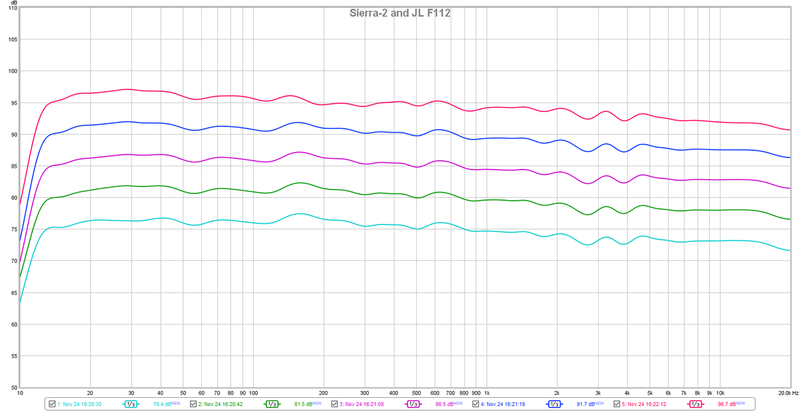 Single Sierra-2 and single JL F112 with Dirac calibration. Measured from my couch around 9ft from the speakers. With my settings and calibration, 95dB is no problem for the Sierra-2. Last edited by mikesiskav; 03-28-2019 at 10:30 PM. FR sweep looks great Mike...top to bottom, you have it all covered (2.2 or 2.? multi-channel setup)!! Those measurements look great. Thanks for putting them up! From what I recall, before you had or 3 or 4 dB boost in the subwoofer over what you have now. How do you like the difference in the sound? Thanks very much. I'm running 5 x Sierra-2 and a JL F112. Thanks N Boros. I'm very happy with the way the system sounds right now. I find only a small amount of boost in the bass sounds best for my setup.